Superheroes have long existed as a way to explore identity, secret or otherwise. Spider-Man is a nerdy teenager. Batman is a powerful but lonely orphan. Superman is a child of two worlds. That those heroes are all white, male, and cisgender is part of their identity too, although we don’t always conceptualize it that way because we have a cultural tendency to view those three identities as a kind of neutral default. “Blood Memory” is an episode that embraces the full complexity of Nia Nal’s identity, just as superhero stories have long embraced the complexities of Peter Parker and Bruce Wayne and Clark Kent. She’s a child of two different alien races, a symbol of her hometown’s peaceful spirit, a trans woman, a plucky reporter, a daughter, a sister, and, now, a burgeoning superhero. None of those identities are necessarily more important than the other, but they’re all part of her story. In other words, TV’s first trans superhero is here and Supergirl handles her origin story with utmost grace. Nia’s story is the most compelling part of “Blood Memory,” and my only complaint is that the episode doesn’t give it more room to breathe. I enjoyed the Kara/Alex/J’onn portion of this episode, which at least emotionally dovetails with the Nia stuff. And the subplot about rage-inducing pills falling into the hands of the Children of Liberty is there to give the episode its requisite dose of action. In both cases, however, I wish “Blood Memory” had pulled back a little to give the Nia stuff more screentime. At times, Nia’s journey feels a little bit more like an outline than a full-fledged story. But at least that outline is really engaging. Thanks to some conveniently cancelled flights (and Nia’s penchant for falling asleep at random times), Kara offers to drive Nia to her hometown of Parthas, a liberal oasis where aliens and humans have been living together in peace for decades. “Blood Memory” efficiently sketches in not only the dynamics of Parthas, but also the dynamics of Nia’s family as well. Her mom Isabel is from Naltor, but left the planet at 18 when she had a dream that she was destined to meet her true love in a small town on Earth. Since then, Isabel has been a leader in the Parthas community and a loving mother to her two daughters, Maeve (Hannah James) and Nia. The family’s assumption, however, was that Isabel’s “one woman per generation” powers would be passed on to Maeve—partially because Isabel had a prophetic dream while she was pregnant with Maeve, but perhaps also, on a more subconscious level, because Nia’s story of womanhood looks different than Maeve’s. With Nia and Maeve, Supergirl continues the complex stories of sisterhood that have always sat at the show’s foundation. The Nal sisters are incredibly close, despite the fact that they’re very different people (Maeve loves quiet, small town life while Nia was drawn to the bustling big city). A big reason for their differences stems from the nature of the Nal family dynamic and those all-important dream powers. Maeve was raised to think she was destined to inherit her mother’s abilities and spent her whole life preparing for that responsibility. Nia thought she was free to chart her own path. When the powers wind up getting passed to the unexpected sister, both of their lives are thrown into a tizzy. It’s a great central dilemma—one that gives Nia a “chosen one” narrative with a whole lot of extra complexity thrown in. Nia doesn’t want the powers and she feels unprepared to take them on, not to mention guilty about “stealing” them from Maeve. In fact, she’d do anything to pass them on to her older sister. Maeve, meanwhile, can’t help but feel resentment towards her sister, both because she’s jealous and because she’s mad that Nia waited so long to tell her, which resulted in months spent worrying she was cursed with “future blindness.” Throw in Isabel’s potentially preventable death and things get even more thorny. Unfortunately, Isabel’s death is the weakest part of the episode and the place where “Blood Memory” feels the most rushed. We don’t even get so much as an ominous expositional line about Parthas’ deadly spider population before a single spider bite has suddenly sent Isabel to an early grave. It’s a clunky bit of storytelling—a clear shortcut to raise the tension between the Nal sisters as Maeve argues (probably not incorrectly) that she could’ve interpreted Nia’s vision to prevent their mother’s death, if only she’d been the one to get the powers. To her credit, however, Kate Burton manages to make a strong impression as Isabel even in her very limited screentime (and even despite a terrible wig). And it’s in her scenes with Nia that Supergirl most effectively uses the metaphorical nature of superhero storytelling to explore Nia’s trans identity. The nature of the Nal family’s matrilineal powers becomes a beautiful affirmation of Nia’s womanhood. As Isabel puts it in the line I quoted at the start of this review, “It was your destiny to be my daughter.” To see a trans identity framed in the superhero language of destiny and heroism is incredibly powerful and incredibly moving. When Supergirl first premiered, it still felt fairly unique to see a superhero story centered on a female hero. Now Nia’s story is an even more unprecedented leap forward for female superhero storytelling. But “Blood Memory” doesn’t sugarcoat the difficulty of Nia’s journey either. The emergence of Nia’s powers also brings out the absolute worst in Maeve, who lashes out at her sister with a shocking attack against the authenticity of her womanhood. I really respect Supergirl for not simplistically resolving Maeve and Nia’s conflict in a single episode, and for emphasizing the fact that even the most progressive, enlightened of people aren’t immune to ingrained social biases. Nia explains that Maeve was her biggest supporter when she came out as trans, yet in a moment of anger, Nia’s identity is the first thing Maeve thinks to attack. It’s really dark emotional material for Supergirl to tackle, but this episode proves the show is more than up for the task. Again, the struggles of Nia’s superhero journey don’t solely revolve around her identity—she has a long road ahead just in terms of learning to control her powers—but Supergirl doesn’t ignore Nia’s identity in her conflict with Maeve either. Nia and Maeve’s fight also ties into Alex and Kara’s sisterly struggles now that Alex has had Kara’s alien heritage wiped from her memory. I’m still slightly confused by the logistics at play (I guess the fact that Alex thinks Kara is human means she never felt compelled to keep her DEO job a secret?) and some of the storytelling is notably clunky—particularly Alex and Supergirl’s standoff over rage-filled teen Bobbi—but “Blood Memory” at least lands on an strong thesis: Growing up alongside an alien sister shaped the foundation of Alex’s worldview, and especially her feelings towards aliens. Without those memories, Alex is a different person with a different level of empathy towards aliens, even if she’s not openly hostile towards them. With both Maeve and Alex, Supergirl is tapping into some interesting ideas about allyship and the limitations of it, ideas I’m looking forward to seeing the show explore further. 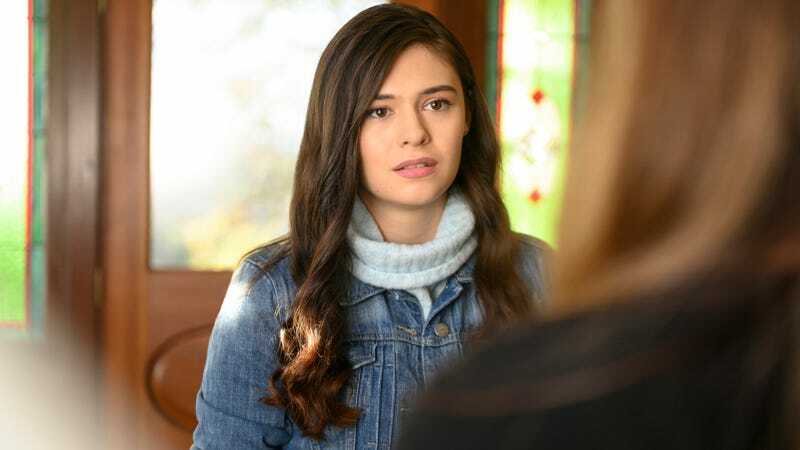 In the end, though, “Blood Memory” is Nia’s episode and a standout showcase for Nicole Maines, who continues to impress in her first ever major acting role. Nia’s rollercoaster ride of emotions reaches an unexpected endpoint as Kara decides to trust Nia with her secret identity. It’s a moment that feels incredibly earned, not least of all because it offers a welcome bit of catharsis after the wrenching Nia/Maeve fight. Supergirl previously explored the idea of Kara as a superhero mentor to Mon-El back in season two, but this setup seems even more promising. As two superpowered women in the midst of complex sisterly conflicts, Kara and Nia have plenty in common with each other. (Indeed, Nia really feels like a callback to the more vulnerable, overwhelmed version of Kara from season one.) But they’re each their own woman with their own specific identities too. “Blood Memory” builds on ideas that have been woven throughout the season, but it also feels like the start of a new story too. Nia might not have adopted the “Dreamer” moniker or donned her new suit yet, but her road to superheroism has truly begun. Why does Parthas have a Harvest Festival in January? Also the existence of the town as a long-standing prejudice-free oasis really drills home just how much Supergirl is retconning aliens into its world. Not only does James kill Mackenzie’s investigation into LCorp’s illegal genetic experimentation, he makes sure to compliment her journalistic instincts while doing so in order to ensure she drops the story. It’s creepily manipulative, and easily the most interesting thing James has done in ages. Red Daughter’s failing health (which is what creates those rage-inducing pills in the first place) inspires her Siberian handlers to call in a mysterious American ally. Brainy posing as a fellow frat bro to get information from two DEO prisoners was a fun scene. There’s really no better distillation of the Danvers sisters than the fact that Kara’s favorite movie is The Wizard Of Oz and Alex’s favorite movie is Terminator 2.